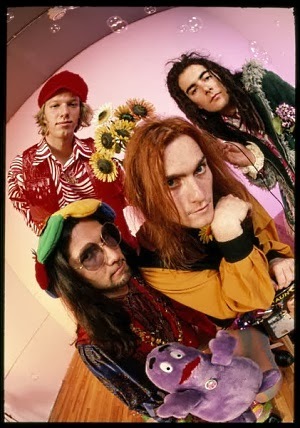 Years ago in the hazy '90s, Roger Manning Jr. and Andy Sturmer, two guys who had survived the implosion of the San Francisco based Beatnik Beatch, shook off the new psychedelic moniker assigned to so many bands coming out of that area and formed the fantastic Jellyfish. Along with bandmate Jason Falkner, they produced 1990's Bellybutton and 1993's much heralded Spilt Milk. The sharp jarring melodies and lush sophistication of the music thrilled fans and critics alike, but sadly before they were able to show us more, the band split acrimoniously, leaving us with the question of what could have been. We spoke to Roger Manning Jr. about the upcoming Radio Jellyfish, his current projects, and what the future holds. Okay, so I want to get right into what's happening on December 10th which is the release of Jellyfish's live radio performances, coming out as Radio Jellyfish. It's a ten-track collection, nine of which were unavailable to your fans before. I know you guys are no strangers to live recordings, but there is something about the stripped-down raw honesty of the recording and the simplicity of a song when it's laid bare like that. Do you think a band and a song delivers when it's performed simply like this and live? In other words, does it test whether it's actually a well-crafted, well-written song without all the bluster of production? Well, it really depends on what kind of style or genre of music we are talking about. I mean, there is some amazing dance/pop stuff that I guarantee you that if you took away all the computerized programming and computer sleight of hand, there wouldn't be much to stand on. And that's just fine. That music is built more around beats than it is actual melody and harmony content. But when you do any kind of music that's classic in a melodic sense and is built on very strong hooks, harmonic movement, with a lyric, it works well with all that. As far as I'm concerned, I love hearing artists do that--just a guitar and vocal, as well as the other side of the coin with full-on production from top to bottom. I love listening to what producers and bands come up with as far as arrangements. But that's only going to work with a strong catchy hook that can hold someone's attention. So I'm proud of those recordings because that's how the songs were written. They were ideas that came from me and my guitar and me and my piano and with the wonderful musicians we had working at our side. We filled in the blanks and we all enjoyed creating very colorful arrangements. Your tenure with Jellyfish wasn't especially long but its impact was deeply felt and stayed potent over the years. You have a rabid fan base and unlike most of the bands that came and went during that time, no one ever wrote you off. You remain a force and many bands cite you as an influence. Besides the quality of the music, what do you think contributed to the longevity of your reach? Kind of what I was talking about before, which is my writing partner and I aspired to kind of pop/rock classicism. We were inspired by so many great writers before us and we saw no reason why we couldn't at least aspire to that. Writing the songs, we took it very seriously. There was a lot of time spent passing it through different standards and different tests, making sure it was in place. And if those songs passed those tests for us, then we graduated to the next level, which was being album contenders. While we were inspired by so many artists from the past, we did try to put our own stamp on things. I think in most cases we were successful and I think that's what resonates with the audience. At the risk of sounding like I'm comparing our group to Big Star, which was another band that kind of came out with two records and were never heard from again, they certainly did not receive the attention they deserved at the time. They were a sales failure at the time, only to be rediscovered by a whole new generation of people seventeen to twenty years later. And I certainly rediscovered them, didn't know about them back then. So for me, the whole reason I enjoy going back to these things is because I thought they were writing great classic pop rock stuff. It could have been done in the sixties, could have been done in the eighties, it really didn't matter. And that stuff I believe ultimately sinks in at deeper levels with a listener. You have to enjoy that style of music to begin with. I do have friends who, believe it or not, are really not interested in the Beatles. There's not too many of them, but they do exist. That sound, that style, that highly melodic three-and-a-half-minute pop, that's not necessarily for everyone. I think ultimately people like singing good melodies in their car, tapping on their steering wheel, whether that's Burt Bacharach, Cole Porter, or the Smiths. Band members come and band members go, as they're prone to do for a variety of reasons. Could be creative and/or personal differences. The members of Jellyfish have all remained working and you've all reunited at certain points for a variety of other projects: TV Eyes, the soundtrack for Lost In Translation, etc. When you guys come back together to work together, is it easier to do so with fresh eyes and to collaborate outside the original parameters, or are there no such pressures and it's just when the time and mood are right? Fortunately, with age you acquire a lot of wisdom and ideally we learn from our mistakes and I'm very happy to say that in working with some of my old bandmates, particularly Jason Falkner, it's been really gratifying to see him and I grow up. Grow up as people, grow up socially, and we bring that into the collaborative process, whether he and I are just playing on a Beck album together or we're working on a production or a song together. It's been really, really gratifying. I wish nothing more than us all going back into the time machine, maybe getting some band therapy, and seeing if we couldn't work through our differences and gotten another one to two records out of it at least. Because when we all did connect and lock and really unite through music, we did some amazing stuff together. I think the public picked up on that. But, I continue to enjoy working with these guys in and out of various projects and it's pretty exciting at our age to do that. You are a multi-instrumentalist but are obviously partial to keyboard. You list many synth-heavy artists like Yes, Thomas Dolby and my favorite XTC as your influences. Has there been one particular favorite that more heavily influenced you at points in your life that you can point to? Or do you prefer to take inspiration from the spectrum as it's needed and at different moments? Oh yeah, definitely from the spectrum. I've gone through periods where, well, wait, if I had to pick one... Andy Partridge and Colin in XTC, they've probably influenced my goals as a songwriter, arranger, pop arranger more than anybody. But there are so many and you know it's a bit of a double-edged sword growing up in the era that I have, because so much incredible music has come before and we are challenged to not simply repeat it. I have the privilege of working with Beck now on and off for almost fifteen years and he consistently impresses me with how he never settles into one kind of style. He is constantly pushing himself. He holds that as almost the highest priority as well as delivering quality stuff and it's been very inspirational to me. He's even younger than me and he's never used the excuse that "all this great music in forty years of rock and roll, it's all been done." I always see him digging and digging . So I'm continually invited to really look for material that inspires me to the degree that my heroes do. It has been very easy for me to go back in time, you know, well before I was born or before I was a child and discover and it's easy for me to get lost in these past worlds. And that's okay, we are drawn to what we're drawn to but one of the fun things is then saying "wow, I really love this sixties psychedelic music from Pink Floyd" and then understanding that coming from Siouxsie And The Banshees or Supergrass, it can all come into play, even though we are talking about roughly thirty years of pop/rock stuff right there. It's a lot to filter and draw from. Speaking of inspiration, we were watching an in-the-studio type video on YouTube way back from when you had released The Land Of Pure Imagination and you're talking about Queen and you were showing everyone the Trident console. That got lots of people geeking out about your studio space and your stuff. You are a fabulous collector of amazing equipment, obviously a hazard of your chosen profession. Is it difficult to incorporate all this fantastic stuff into practical use or are you finding yourself collecting these magnificent historical pieces for the sheer fun of it and hope you'll find a way to use them eventually? Well, a little of both. I mean, I'm a fan of so many of those instruments that I've had the pleasure of owning. For me, when I arrange a song, it's all about the song, so if the song requires a vocal and string quartet, even if I've got two hundred wonderful keyboards to help me do that, I'm still going to try to get a string quartet to play it. But yeah, I've enjoyed it, gosh I like it all. I like as many guitar and guitar sounds as I do keyboards. So I don't try to exclusively make keyboard-oriented music, although it's really really fun to do bass parts, say on a bass synthesizer as opposed to having a regular bass player. I just try to continually let the song decide what it wants to be, getting out of the way and letting the idea not get arranged to death and have all the... You know you can overproduce a song. Jellyfish has certainly been accused of that in the past and in some cases I might not argue with that criticism. But you just have so many ideas in your head and they all want to come out at once and again, working with a guy like Beck, one of the things I've learned is you don't do something just because you can. He's really taught me and my friends about restraint and the art of holding back. Less is more. And then of course letting the floodgates go when it's time for that too. Hard to know the difference. Yeah it is. It's a neverending challenge and you just hope that you get better and better at it the more you do it. In 2009, you appeared on stage at SXSW with Cheap Trick. Did you have one of those "look who we are on stage with" moments as you glanced around? Oh yes. In fact, Jason and I had started playing with them months before on the east coast for some pretty small club promotion dates they did after releasing that record. And of course we were just completely stunned that the band had even thought enough of us at all to invite us into what was basically making some of these initial shows extra special, so they wanted to flush them out with more guitar and keyboards and more singing. Trying to create little ways of making it less average, if you will. So we couldn't believe that it ended up working out that way and I'll never forget the first night. I think we were playing a show in Virginia in some small club and I think the second or third song was "Surrender." Jason and I stood at opposite sides of the stage and we both went up to sing our background parts, which were all parts we heard and knew from childhood, and I remember catching his eye and we looked at each other and we were both laughing so hard at the absurdity of like "no we're not dreaming, but this still is not real." Somehow this is happening and our response was just to laugh until we both... we didn't even sing the first notes because we were almost gagging with laughter. Of course we both resumed singing our backup, but it was that nuts. I think I ended up playing five or six shows with them, Jason took four or something. But we got the first three and we even got to open the show too, which was just absolutely insane. We did two Jellyfish songs, two Jason songs, two of mine. It was such a treat and the audience really seemed to dig it too. The movie Get Him To The Greek, you were the keyboardist and guitarist for Infant Sorrow, the fictitious but still compelling band. How did you get involved in that? Was it more about who you knew in the world of soundtracks or film? Yeah, it's another wonderful connection from the Jellyfish/Beck world. So the one and only reason that happened is because a good friend Lyle Workman was scoring the film. And he played on the Spilt Milk record as you may remember and he also was in Beck's touring band with me for about two years. He and I played on albums together, he's just a dear friend who continues to this day. He's had me on a couple of the soundtracks he's done. So he just grabbed a bunch of us who he thought would be perfect for stand-ins, and I don't remember in the movie, but I think we got barely any time on film. We filmed off and on for five days at the Greek Theater. And then my parents are like, "We saw that film. Where the hell are you?" If you look really hard... and squint. So tell us what we can expect in addition to the live Jellyfish album from you this year? Fortunately, I continue to perform and record with Beck which just continues to be one of the most gratifying things in my life and he's got a new album coming out in the spring that is as good as if not better than anything he's done. I'm so happy that he asked me to be a part of it, I think it's been five, going on six years since he's had any kind of official release, so it's kind of a big deal. So then of course we are going to promote that with some touring next year. I'm not sure to what degree. But certainly we will be on the road and then in between, my biggest priority is to get solo album number three out. Really? When is that coming? I'm very excited to tell your readership that I'm going to be doing it in a new way this this time and not only am I going to be probably using a lot more of my friends such as Jason and the other people I know to perform on it, but I'm going to be reaching out through PledgeMusic.com and basically do a fan-funded album. It's going to have incentives, which I'm still deciding what those are going to be, but there's going to be no shortage of exciting reasons for this incredible group of fans to continue to support us. The Jellyfish fanbase and the projects that we've done after, it just continues to blow my mind because it's not just in one place. It's these wonderful pockets of fans all over the world and they add up to some very dedicated people that just continue to blow my mind and make me excited to do what I do. It's almost like, I love playing with Beck and doing all the things I do, I just want nine months where I can finish another album. 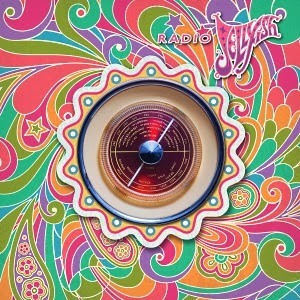 Click here to preorder Jellyfish Radio.